Sláinte to Cork’s Irish Pub of St. Paul. 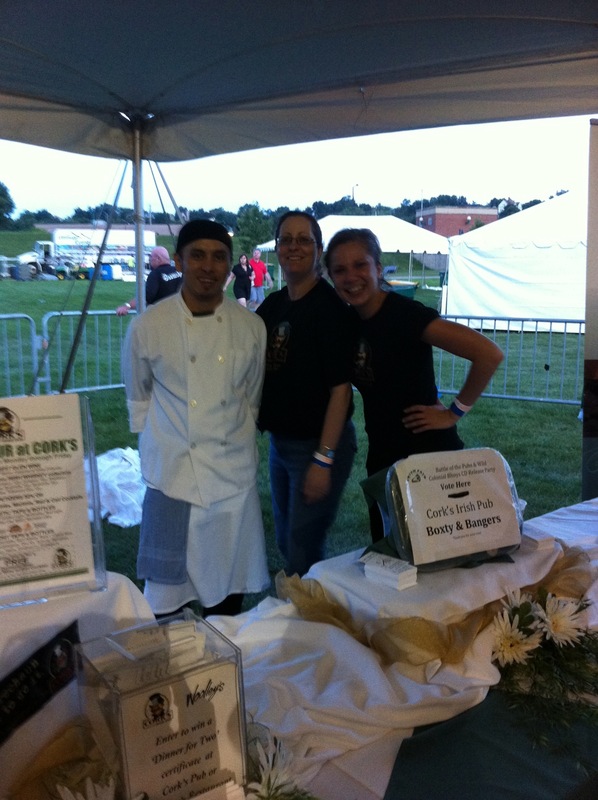 They won the Pub Fare Battle at last night’s opening Battle of the Pubs Cookoff at the Irish Fare of Minnesota. Their food was gooood! Braised greens, corned beef, and sausage. FIVE friendly people were working the tables that were decked out with table clothes, swags, greenery and gorgeous plates of food. Prizes! Enter your name and address for a free dinner. Coupons on the standup bar tables for free beer. Music and game schedule on every bar table. Their competitor had some tasty ribs, a hand made sign and one person serving — so no “presence” to say the least. So congrats to Cork’s Irish Pub. They won with great food and fabulous marketing. For some great photos, click here!